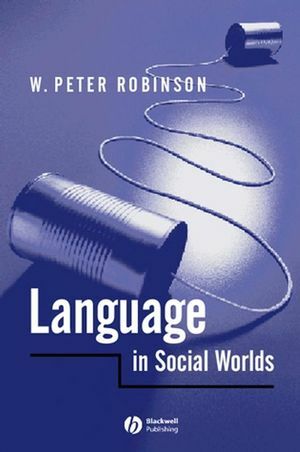 This is the first text on language in communication written from a social psychological perspective that sets issues in their broader biological, sociological and cultural contexts. W. Peter Robinson is Professor Emeritus of social psychology and a Leverhulme Research Fellow at the University of Bristol. 1. Contextual Framework for Social Psychology of Language in Communication: Aims and Issues. 2. Language in and out of Context: Structure and Substance. 4. Non-Verbal Communication in Non-Human Creatures. 6. Encounter Regulation and Conversation. 7. Regulation of States and Behaviour of Self and Others. 8. Regulation and Marking of Social Relationships: Shaking Hands. 9. Terms of Address and Reference, and Being Polite. 10. Marking of States, Identities, and Settings: Issues. 11. Marking of States, Identities, and Settings: Data and Their Interpretation. 12. The Representational Function (F7). 13. Mass-Mediated Communication: Spirals of Spin and Broken Swords of Truth. 14. Representation and Regulation: Their Relevance to Social Class. 15. Five Theories and a Representation-As-Default Thesis. This is a comprehensive text on language and communication written from a social psychological perspective. It shows how language and non-verbal activities are integrated in the process of communication and looks at what language is used for and how it works in context. For each topic a brief review is followed by evidence about the roles of verbal and non-verbal activity. In all cases, descriptions and explanations are accompanied by data and experimental findings, ensuring a balanced approach.